Mission Concepción at Night2 - We capture this side view of the Mission Concepción right before the skies open up and poured for a good while. I like the side angle it just give a different pov of this historic landmark in the city of San Antonio Texas, looking through the palm trees. The Mission Concepcion was built in the 1755 and has been wll preserved for over two hundred years and it one of the few mission that has not been rebuilt. 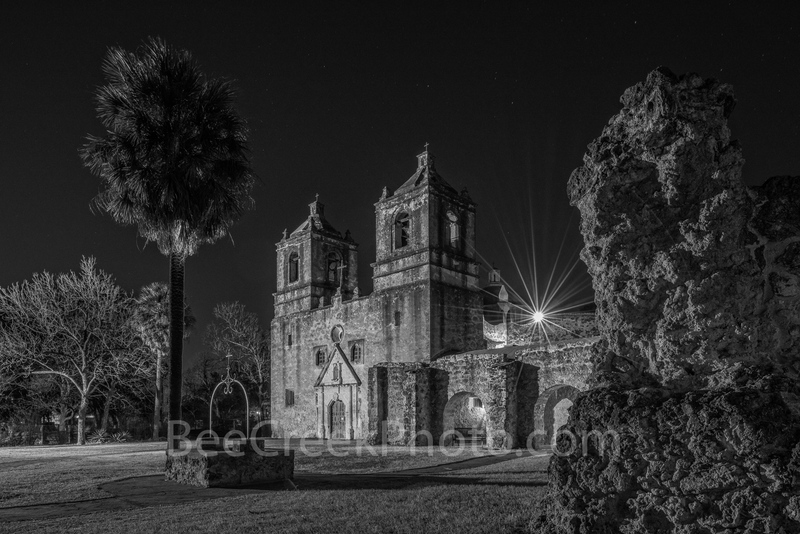 This church is both historic and a San Antonio landmark for tourist and locals. Mass is still given here every Sunday. The Battle of Concepcion was also fought here by James Bowie and James Fannin in 1835. This is one of the many missions in the city that are considered world heritages site because of their history and longevity. Photo © copyright by Bee Creek Photography - Tod Grubbs / Cynthia Hestand.